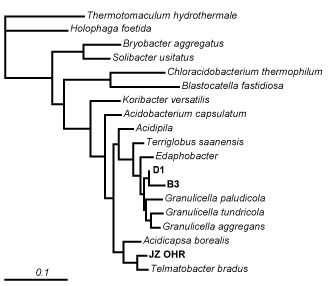 Acidobacteria are highly abundant in most soil bacterial communities, but are rarely cultured in the lab. The ones that have been cultured grow very slowly and generally require specialized growth media. Acidobacteria probably represent the ultimate K-selected microbe: they very gradually build up populations and then hang on forever, dividing once a month or so (I made that number up). So who are these mysterious denizens of the dirt, and how do they make a living? We have finally managed to culture a few of them in the lab. Two isolates are from Colorado subalpine forest soils (D1 and B3 on the tree above). It took about 4-6 weeks for colonies to appear on the plates (VL55 media). These two appear to be new species of Granulicella, based on the 16S rRNA tree above. We now have a good genomic sequence for one of them, and indeed its closest match is Granulicella mallensis. JDPE student, Erin Oliver, is currently working to get more Acidobacteria and other slow-growing isolates from these soils.